With a sense of high anticipation in the air, the time for The 2017 Atlanta Jewish Film Festival was finally here! 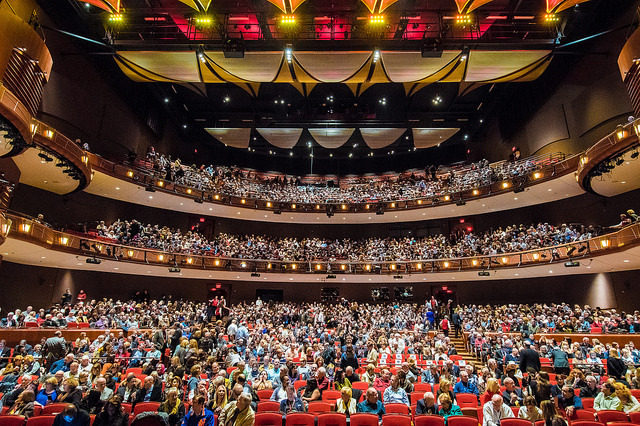 Tuesday night, the majestic Cobb Energy Performing Arts Centre in Atlanta quickly began to flood with long-time patrons, media affiliates, industry personalities and film lovers. This, my second year attending this amazing film festival, left me totally excited to see what the opening ceremony had in store for us. And to my point, the ceremony from start to finish was just excellent! From the plethora of cuisine sponsors and their delectable selections to the administration, greeters, and overall hospitality, they did not miss a beat! The AJFF opening gala is always an upbeat atmosphere that allows guests and industry professionals alike the opportunity to mix and mingle in a very classy place. In fact, the gala is the ideal space for networking among like-minded people who passionately appreciate the cultural enlightenment that this film festival has to offer. Following the conclusion of the gala, we all made our way into the main arena in preparation for the feature screening Alone in Berlin. Despite technical difficulties in the beginning, the crowd was electrified to be present that night and you could tell that everyone had high hopes for the opening film. Not to mention, we were being serenaded by an amazing band posted in the balcony prior to the show starting. Finally, at the top of the show, we were pleasantly surprised to receive an official welcome to the 2017 AJFF by Atlanta Mayor Kasim Reed! Mayor Reed told us that we should be a very proud city to hold the position of hosting the world’s largest Jewish Film Festival as well as the fact that our very own Atlanta Falcons are in the Super Bowl! Just before the Alone in Berlin began, AJFF Executive Director Kenny Blank and AJFF Board President Steve Labovitz came on stage to share with us that we are living in a very exciting moment to witness history unfolding as the Atlanta Jewish Film Festival works tirelessly year-round to “Achieve new ways of culture and social understanding in a way that only film can." And that we should all be grateful to be a part of a city and event that believes in "making arts a priority in our community". This film, Alone in Berlin, is a heart-gripping story of a middle-class husband and wife in Berlin Germany who tragically lose their son at war and who choose to defy the Nazi regime by leaving random post cards throughout the city as a form of silent protest. Actors Emma Thompson and Brendan Glesson execute and splendid performance of this couple’s grief to action. And knowing that this was based on a true story, we were all left utterly touched by their courage and unyielding determination to avenge their son’s death and the powerful political statement of justice they left behind. For more information about this film, the 2017 Atlanta Jewish Film Festival and to purchase tickets, please visit www.ajff.org.